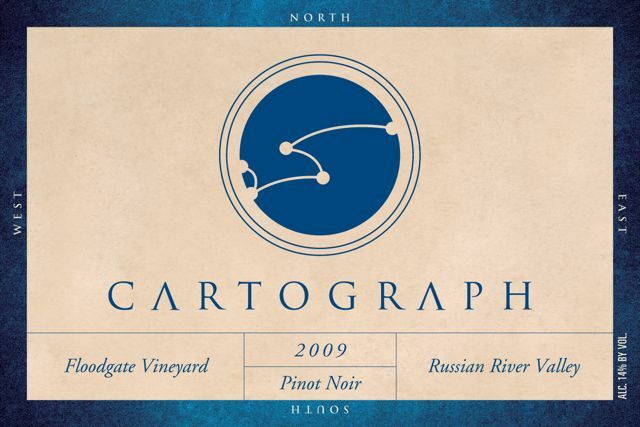 We wrapped up the ’09 Cartograph vintage by bottling the ’09 Pinot Noir on Thursday 8/19. It is amazing to look back on everything that has happened over the past year and to be at this point. 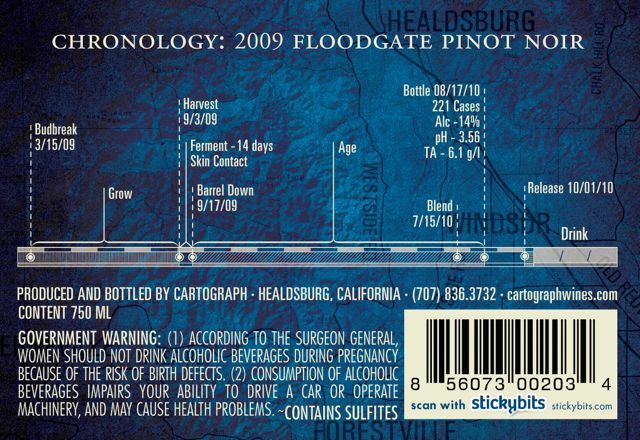 One year ago we were scrambling to get all of our licensing in place to crush under the new Cartograph label after moving operations to Healdsburg in June ’09. Nothing was for certain as we prayed for cool weather to delay harvest so our 02 Winegrower License would come through before the grapes hit the winery. Everything fell into place and looking ahead to harvest 2010, things are much more calm. Watching the million moving parts of the bottling line gently gobble up empty glass and spit out full cases felt great knowing that the year we bumped up production (a whopping 320 cases of Pinot Noir) will go into the history books as one of the best Pinot years ever in California. This past Thursday we bottled the Floodgate Vineyard and Perli Vineyard Pinot Noir. Both are vineyards we are working with again this harvest. The mobile bottling line is housed in a semi truck, which pulls up along the side of the winery. Using various hoses, the wine moves via gravity flow from the second level stainless steel bottling tank down to the first level where the bottling line is. The fill drum on the line gets filled with wine and the line kicks into action. Boxes of bottles are opened and put on the line and the bottles begin their conveyor ride into the heart of the bottling beast. The conveyor gently moves them to be sparged with Nitrogen gas then on to the filler, corker, foil applicator, and finally off to the labeling portion on the other side of the truck. Once labeled, the bottles are assessed by hand for “prettiness” and then placed in a box where they rocket down a conveyor into the waiting hands of the crew. The crew stamps the boxes with the date and our bonded winery number then moves them over to the pallets where they are stacked and prepared for storage. We used the same mobile bottling line to do the 2009 Floodgate Gewürztraminer back in February, and again, they did a stellar job. They can bottle about 270 cases per hour! We were thrilled to have seven pallets (320 cases total) of Pinot Noir! The wine will now adjust to being in bottle and when it is ready, we’ll release it for everyone to enjoy. Many thanks to all the people who helped make the final ’09 Cartograph bottling a great success! Next post: Send the Sizzle for Shizzle!